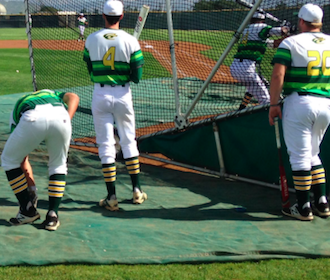 Grossmont takes pre-game batting practice on Thursday afternoon. EL CAJON (2-17-17) — For the second time this season Grossmont lost to Chaffey, 7-4 in a non-league game at Noel Mickelson Field on Thursday (Feb. 16). Chaffey won the game in the 9th inning on a solo home run by Aaron McCann. 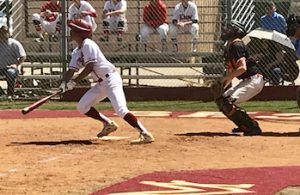 Christian Valdez hit a double down the right field line to drive in a run, and Patrick Keller swatted a sacrifice fly to give Chaffey a 7-2 lead. Grossmont counterpunched with a 2-run homer by ROBERT BOSTEDT in the bottom of the 9th but it was too little, too late. The Griffins wasted another solid pitching effort by DONAVON McCRYSTAL, who allowed only 2 earned runs in six innings. He struck out 5. T. Beard flied out to rf, sacrifice fly, RBI; M. Diffley scored. J. Nichols doubled to right center, RBI; O. Martinez scored, unearned. J. Osuna flied out to cf, sacrifice fly, RBI; J. Nichols scored. O. Martinez flied out to rf, sacrifice fly, RBI; C. Valdez scored. O. Martinez flied out to rf, SAC, RBI; P. Keller advanced to third; T. Lander scored. D. Maldonado doubled down the lf line, RBI; N. Navarro scored. A. McCann homered to right center, RBI. C. Valdez doubled down the rf line, RBI; J. Longtin scored. P. Keller out at first 1b to 2b, SAC, RBI; T. Lander advanced to second; C. Valdez scored, unearned. R. Bostedt homered to right center, 2 RBI; C. Fullen scored.